Rent a jet ski, kayak, or sail down the Intracoastal Waterway. Show your crew who's got the moves. Newly remodeled rental condos are spacious and comfortable. Complimentary continental breakfast will fuel you for a busy day ahead. Head to the nearby Grand Coastal Mall for a little bit of shopping or a movie on a rainy day. Short Walk to Myrtle Beach Watersports Inc.
Staybridge Suites Myrtle Beach - West is a dog-friendly resort located near some of the best attractions in the area. Get your day off to the right start with a stop at the daily breakfast buffet. After breakfast, head back to your condo and get changed into swimsuits, grab dive sticks, goggles and inflatable crocodiles and get ready to hit the outdoor pool. Don’t forget the sunblock! Swim laps around the pool or lounge poolside with that book you picked up at the airport gift shop. When it’s time for lunch, fire up the bbq grills. Let the little ones help carry hot dogs, burgers and sides and get ready for a fun family cookout. Get in touch with your inner athlete and challenge the kids to a friendly game on the basketball court. Studio condos and one- to two-bedroom condos sleep two to six guests. Full kitchens have everything that you need to whip up anything from sandwiches to multi-course meals. Get groceries at the on-site convenience store or for more variety head to Food Lion. Surprise the kids with build-your-own pizza night and let them go wild. The on-site laundry facility is sure to come in handy for post-pizza cleanup. When it comes to in-suite entertainment, Staybridge Suites Myrtle Beach - West does not disappoint: Flatscreen TVs have premium cable, in-room movies and DVD players. Bring favorite movies from home or browse the room’s selection, pop some popcorn and call everyone into the living room. First kid on the couch is in charge of the remote. Set by the Intracoastal Waterway, the resort is right across the street from Myrtle Beach Watersports where you can rent jet skis, kayaks, or go for a banana boat ride on this beautiful Carolina river. Gather all of the golfers in your party and head to River Oaks Golf Plantation. This twenty-seven-hole course (made of three sets of nine-holes) was designed by Gene Hamm and Tom Jackson. The course opened in 1987 and was renovated from 2007 through 2010. River Oaks Golf Plantation welcomes golfers of all skill levels. While the golfers are occupied at River Oaks, let the shoppers visit Coastal Grand Mall for some retail therapy. There are two major department stores at Coastal Grand Mall: Dillards and JCPenney. Stock up on cosmetics at ULTA Beauty. Let the shopping fun continue at Broadway at the Beach. Treat yourself to a new pair of shades at one of the three Sunglass Hut locations. Let the kids create their own stuffed animal at Build-a-Bear while you create your own unique piece of jewelry at Pick a Pearl. Stop by Reigning Cats & Dogs to pick up a surprise for your dog back at the resort. Meet back up with the rest of your party and go for a ride on the SkyWheel. 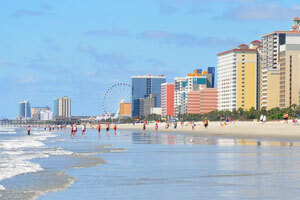 It’s almost two-hundred feet tall and provides the best views of Myrtle Beach.